On a Tuesday morning last November, Harold Backer—Princetonian, Olympian, and financier—went for a bike ride and disappeared. Overcoming regulation and fragmentation: investment funds need adaptability and local expertise. BNP Paribas Securities Services' Phillipe Ruault and Orla Mc Tiernan explain that the agent bank model has more to offer than simple connectivity to T2S. Singapore provides a symbolic backdrop for Sibos 2015. Not only does the country celebrate its 50th anniversary of independence from Malaysia but it also makes an increasingly significant contribution to the global economy of which financial services is part. This year’s Sibos, notes Satvinder Singh, head of Institutional Cash and Securities Services at Deutsche Bank, is particularly important given that new regulations and initiatives - from TARGET2-Securities (T2S) to combating cyber crime – as well as technological change and client requirements are now beginning to take effect. In this video Singh notes the impact this shifting environment is having on banking, and the opportunity for collaboration that is presents. To watch the video, please click here. Global Custodian recently hosted its Leaders in Custody Awards in London. This year, in addition to our survey awards, we introduced a new format to the programme with three new sets of awards. Bank stocks have been punished by the markets. Is the panic overdone? Due to challenges such as risk and cost, 81% of pension funds will explore bringing more asset management responsibilities in-house over the next three years, according to a new report from State Street. 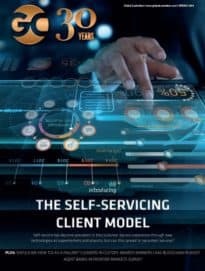 New research has found that for the first time in the modern financial services-era the majority of business leaders are eager to have the chief financial officer (COO) play a leading role in driving business model change.